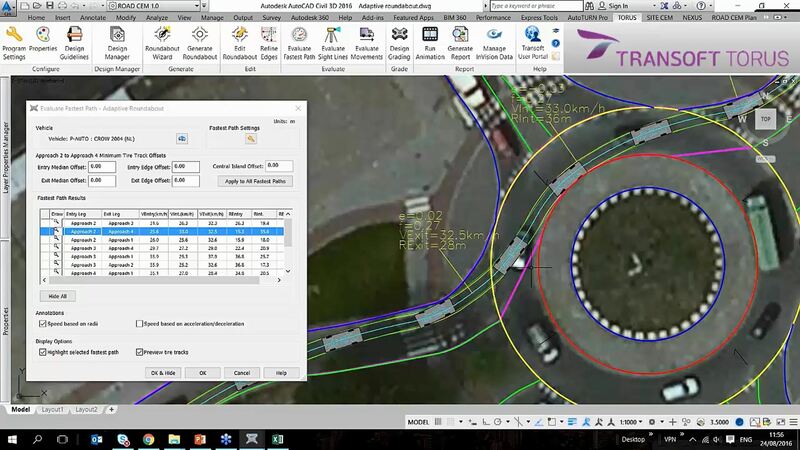 TORUS’s unique tool, called the Adaptive Roundabout helps engineers worldwide to analyze vehicle swept path and speeds on any roundabouts geometry. This video shows you how vehicle speeds can be checked on any kind of roundabouts to ensure safety of vulnerable road users (i.e. : cyclists and pedestrians). In this example we are using AutoCAD Civil 3D, but you can also use AutoCAD or BricsCAD. TORUS is a unique CAD application, which helps civil engineers to design roundabouts based on vehicle swept path. For the calculation, the world’s most widely used and well known swept path software, AutoTURN®. This video is part of a recorded TORUS webinar. Full webinar recordings can also be found at our webinar section.